I don’t know quite what this salad is. 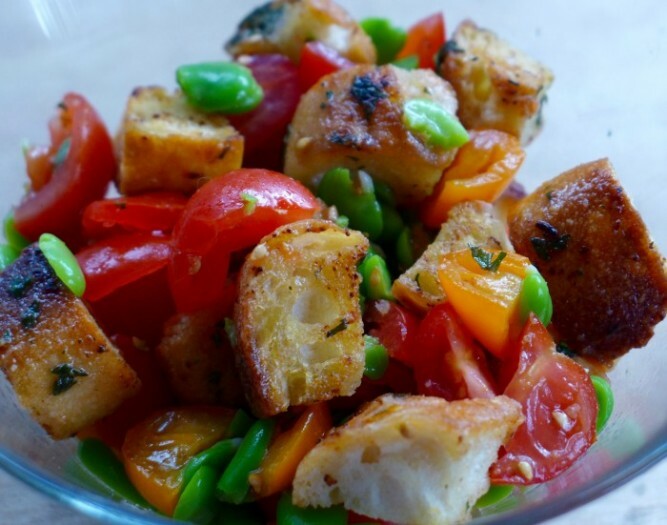 It is like panzanella, the Tuscan bread salad in that it uses stale bread and tomatoes, but the bread is crispy…and it has broad beans in it. Whatever it is, it is damn good. I made it because I had too many larger broad beans in the garden, some very ripe cherry tomatoes and some stale bread. Not very appealing individually, but together they are great. I made large garlic bread croutons of the bread, made a panzanella like dressing with tomato juices, red wine vinegar, olive oil and salt. And piled in a heap of double podded broad beans. I just love double podded broad beans. They are a bit of a pain to peel, but I think they are worth the effort for the beautiful jewels that are the result. This is definitely a dish that is more than the sum of its parts. Back for 5 mins, shake to turn over and bake for another 5 or so minutes until the bread is golden brown and crispy. Don't cook it until it gets hard and tooth breaking. It should still have some give under the crunch. Put the podded broad beans into boiling water, bring back to the boil and cook for 30 seconds. Drain, rinse under cold water and pinch off the coarse outside skins to extract the brilliant green insides. Crush the mixture a little bit with your hands, just enough to release the tomato juices. Fold in the croutons and the broad beans.